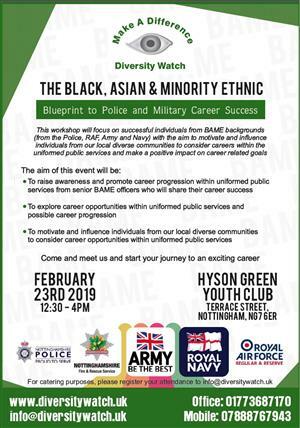 There will be a workshop that will focus on succesful individuals from BAME (Black, Asian & minority ethnic) backgrounds from different services, ranging from Police, RAF, Army and Navy. The aim of the workshop is to motivate and influence individuals from our local diverse communities to consider careers within the uniformed public services and make a positive impact on career related goals. It will be held on February 23rd 2019 12:30-4pm at Hyson Green Youth Club, Terrace Street, Nottingham, NG7 6ER.